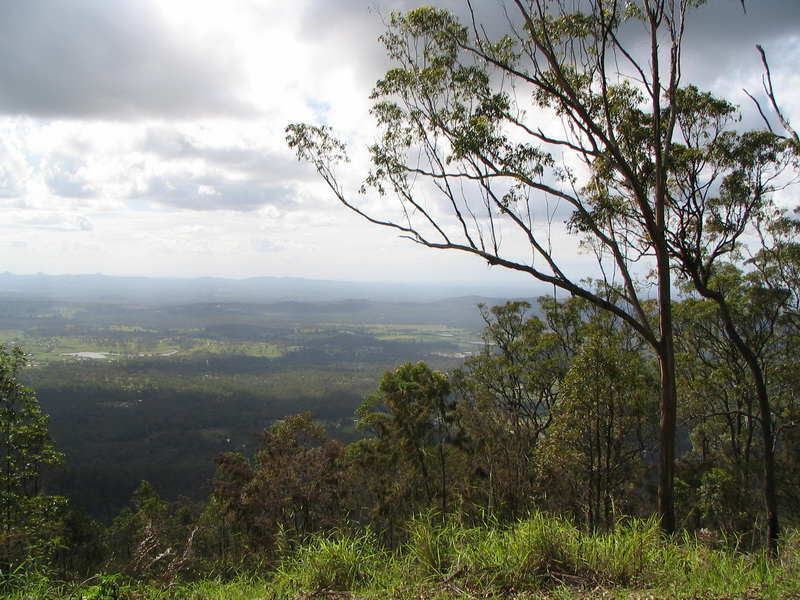 This watercolor landscape painting is based on a photo from Tamborine Mountain in Queensland, Australia. It has mostly a grey sky with lots of green in the landscape. I was attracted to the scene because of the feeling of space it engendered. For this watercolor (watercolour) demonstration I have kept the sky mainly a grey color but if you want to add more light to the scene then you can change the sky from grey to blue and maybe add some fluffy white clouds. This watercolor demonstration can apply to any similar vista landscape scene, though the trees will be different depending on your country and may need to be painted with another technique for example, they may be pine trees which I paint using a fan brush. Brushes: Round watercolor brushes sizes 24, 16, 12, and 8. Watercolor paint used: Winsor and Newton artists quality water colors, French Ultramarine, Cobalt Blue, Burnt Sienna, Cobalt Turquoise, Aureolin, and Raw Umber. Other equipment: Water spray bottle which produces a very fine soft mist. 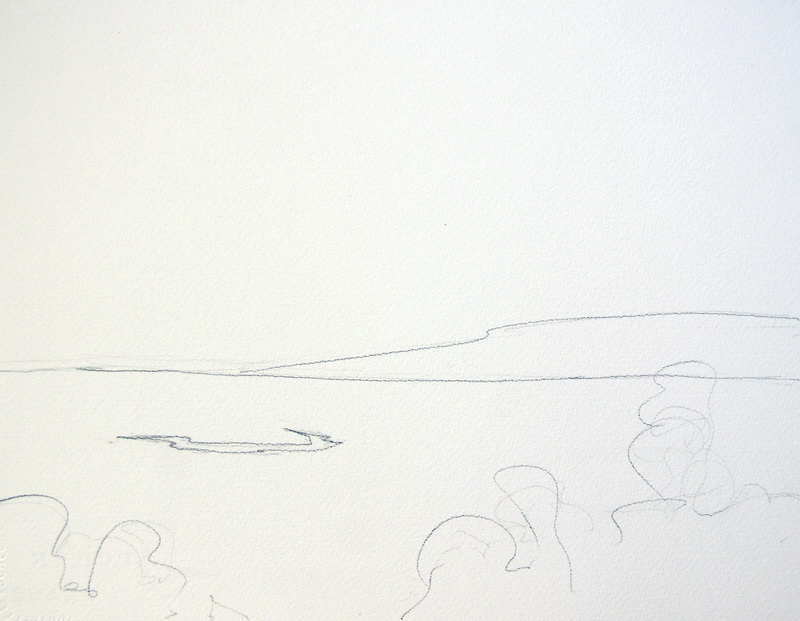 The drawing for this scene is kept quite simple as most of the distant vista will be soft edges. In my drawing for this demonstration the pencil marks are shown quite firm but that is just for photographic purposes, in reality keep them very light so they do not show through on the final painting – especially for the middle distance hill on the right and where it meets the ground in the distance. The most distant hills I have not indicated at all. The small lake with a stream running from it is the only feature I wanted to make sure of so it was drawn in to remind me not to paint over it and where to place it. The foreground tree line is just a rough indication of where the trees will go. You can see that I purposefully moved the lower portion of the tree line towards the right because, in the photo, that section would too close to the left hand boundary and did not make for a good composition. The other change I made from the photograph was to lower the horizon (not drawn in) to allow for a larger sky area and so enhance the feeling of space. The two significant trees on the right hand side of this scene have not been drawn in; they will be painted in right at the end. If you like you can lightly indicate where they will go however by leaving them out for now it gives me a lot more freedom about their final placement. Trees are very useful for covering up parts of your painting with which you are not happy! Drawing for green mountain vista watercolor painting.